In 2010 I completed the SLAV Web 2.0 course along with several other teachers at St Luke’s. At this time a blog was started for our two grade 1/2 classes – Junior’s Jig. My level partner Verona maintained the blog with my class chipping in posts every now and then. This year my class Junior M have the very own blog (we signed with blogger after much unsuccessful wrangling with wordpress), Junior M’s Learning Journey. My aim for the blog is to provide the St Luke’s community (parents, families and friends) and a gradually developing group of global friends (through twitter), an insight into the learning Junior M is engaged with most weeks. Recently, my students made a significant connection with a school in Ontario, Canada with whom we are twitter-friends. After we posted questions on twitter to the Gill_Villeans they asked us if we’d like to host their class mascot, Gill the goldfish, and to add photos etc., of his adventures at St Lukes on their wiki. Their teacher is using this as a platform to further engage her students in writing. Over the term holidays we will send our class mascot, Ella the echidna, to Canada. Students in Junior are fascinated with the process of receiving a package from overseas and have many ideas for how to host our visitor, which they actively implement. I feel this process of blogging and commenting on blog posts extends the children, from enriching their thinking both laterally and critically, to exposing them to a world beyond their classroom. This in turn shows them how much in common we have with people around the world. The understanding of differences and similarities that comes from global collaboration is priceless. Thankyou, Michelle, for sharing your teaching and learning with us. All the best to Ella on her big trip. Michelle and Junior M – a great blog to reflect on your learning and a great opportunity for parents and the wider community to experience your thoughts and new thinking! Well done Michelle for using the tools to enrich the learning experiences and understandings for the students. It is obvious from the posts that they are engaged and motivated. 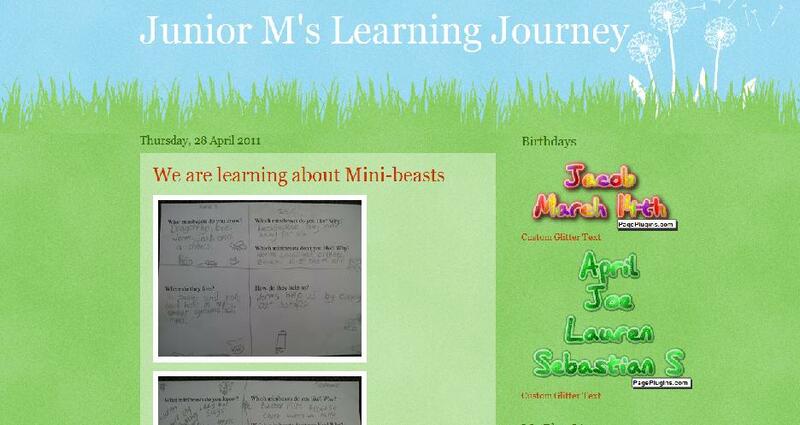 I have visited Michelle’s blog and have been very impressed with the learning being shared. I was particularly interested in the connection with the school in Canada. These sorts of learning opportunities really take the students beyond the classroom. I would love to hear what the students think about what this experience has done for them and their learning.